Spain’s two biggest clubs came head-to-head in this early season title decider. Most games in this league are somewhat a formality for the two clubs, therefore this was seen as a must win for both with Barca looking to extend their lead at the top of the table to 6 points and Real Madrid manager Rafael Benitez under increasing pressure from fans and the media. It was sure to be a fascinating game not only due to the personnel on show but the contrasting styles of the two teams and managers. Real were boosted by the return of James Rodriguez, Gareth Bale and Karim Benzema while Barcelona talisman Lionel Messi had to settle for a place on the bench after two months out with a knee injury. Despite this, Luis Suarez and Neymar seemed unfazed by his absence scoring Barca’s last 17 league goals leading up to the fixture. With a sturdy defence, a buoyant home crowd and an unbeaten home record in the league stretching back 22 games, Los Blancos appeared to have every chance of snatching a win at the Bernabeu. However, Barcelona were rampant with Neymar, Andres Iniesta and Luis Suarez on target to put Real Madrid to the sword and leave Benitez on the brink. Real could only be described as shambolic from a tactical perspective in this game, with an abysmal and peculiar positional structure, two 6s in Luka Modric and Toni Kroos who were unable to protect their back 4 and a ridiculously uncoordinated pressing scheme. For large periods of the game, Real seemed incapable of building a stable attack. Too often, play broke down in the final third and they were unable to form connections across the field. This meant difficulty in forming combinations which resulted in them resorting to aimless crosses which at times did threaten the Barcelona back 4; however such chances were few and far between. Most of the time they struggled to penetrate the Barca defence and failed to create overloads. In the image above we can see one example how Real set up in the attacking phase. Here Danilo is in possession out wide with no forward passing options and has no choice but to play it back to Ramos, a trigger for Barcelona to initiate pressure. Just by looking at the picture, one can identify numerous issues with their structure. One of these is the complete lack of connectivity between the midfield and the attackers. For some reason, all 4 attacking players chose to try and provide depth to the attack even though only 1 or 2 would have been sufficient. With all 4 players occupying the back 4, none of them are available to link the midfield and the attack, leaving the entire team disjointed. There is almost zero compactness between the units, leaving the defence unable to find a player to bring the ball into the next phase of the attack. This abysmal structure also led to a lack of access to the centre, which we can see in the red square. There are 3 Barca players and none for Real Madrid, Barcelona have the overload in the area which is the most pivotal in any game. 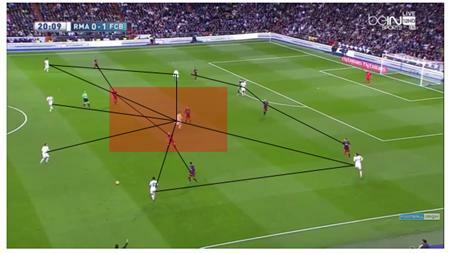 With such a substantial overload, Barca are in total control of the midfield zone and therefore in control of the game. Perhaps Benitez may have intended to create space between the defensive and midfield lines by forcing back the Barcelona defence with depth. Although, this seems a bit misguided seeing that all 4 attacking players attempted this, leaving no one to exploit the space between the lines. Above is another image of Real struggling to create effective connections in the attacking phase. Although they did not attempt the peculiar tactic as seen in the first image this shape still has its issues, the main one being a failure to overload the centre. James is the only Real player in central midfield crowded out by the Barca midfield. 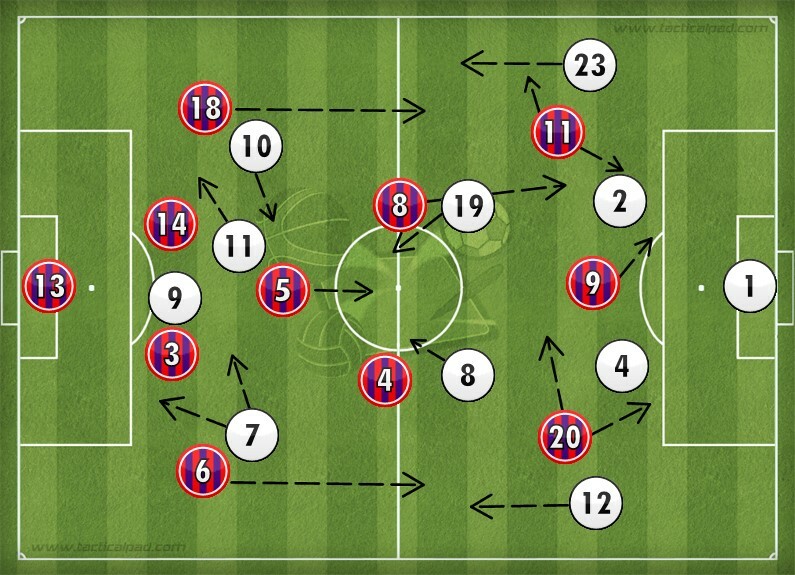 As a result, they cannot penetrate Barcelona’s 4-1-4-1 block centrally. Even if they were unable to play into central areas, Bale (wide right) could have gone wider to isolate Alba and Danilo could have overlapped. Instead they try to play into James in the centre and Barcelona regain the ball with ease. It seems a bit confusing that they did not utilise the full-backs Danilo and Marcelo, both of whom are known for their attacking prowess. Pushing them forward may have allowed Bale to move into the half-space or into the centre. Real appear intent on playing through the block instead of around it. Here we see Barcelona in their attacking shape in a vaguely similar position. 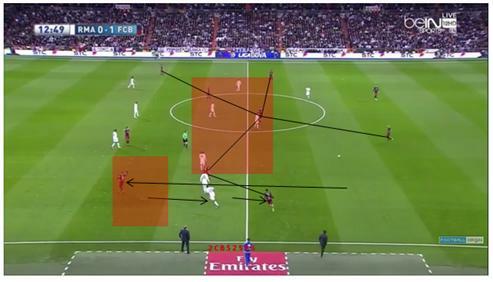 The main difference between the two set-ups is Barcelona’s staggering and central access. 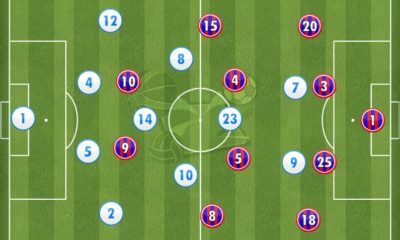 Mascherano is in possession and has 3 vertical passing options; his Barca teammates are spread out evenly across the field. It is also clear to see the difference between the sides in terms of distance between players. Barca’s set up makes them much better equipped for short passing combinations and playing between the lines, as was evident in all of their goals. 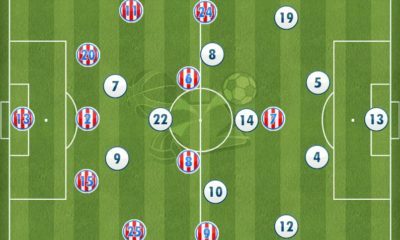 They create numerical equality in the midfield zone unlike Real Madrid yet at the same time maintain their occupation of the wide areas. This allows them to vary their attack by attacking through the wide or central areas. Despite Real’s atrocious performance, nothing should be taken away from Barcelona who were magnificent for the entire game. 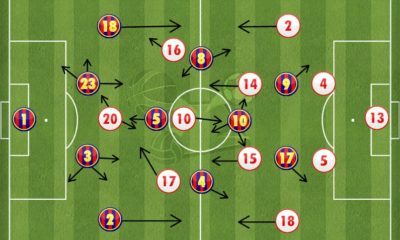 They were dominant in virtually all phases of the game and zones of the field due to their intelligent positioning but seemed intent on exploiting the left through Neymar and Iniesta who ran the show for Luis Enrique’s side. This was a ploy used often by Barca to take advantage of Neymar’s ability to beat his defender 1v1. They would often use Real’s emphasis on ball orientation to their advantage and open up spaces on the other side of the field. Often when he received it in this position he was able to run at Danilo frequently, wreaking havoc at every given opportunity. 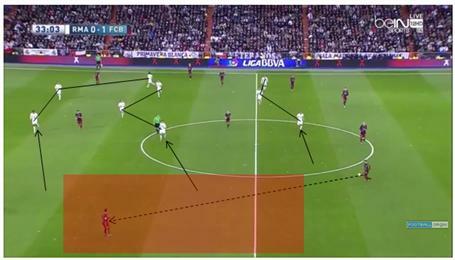 This in turn opened up half-spaces for Iniesta, an area where he functions best. By Neymar hugging the touchline on occasion it attracted Danilo towards him which gave Iniesta even more freedom in the final third. The lack of balance in Real’s midfield also proved decisive. Their decision to field both Kroos and Modric, two players who are in no way defensive minded midfielders was one of the keys behind Barcelona’s victory. 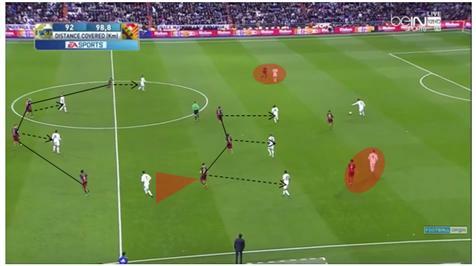 Unlike the Catalans who had Busquets constantly sitting in front of the back 4 providing protection, Real had two 8s playing in the double pivot that are prone to push forward and support the attack rather than sit and provide defensive cover. This resulted in frequent exposure in defensive transitions as they were without a defensive overload on most occasions, which is very dangerous when pitted against such talented attackers like Luis Suarez and Neymar. The image above was the build-up to Barcelona’s sublime 3rd goal finished off by Andres Iniesta. Neymar makes a run to overload the empty 6 space and force back the Real Madrid defensive line. Although both Kroos and Modric are in the zone to provide cover, neither are prepared to protect the back 4 judging by their body position. They both look to be attempting to recover in defensive transition after a failed Real Madrid attack. Neither is in front of the ball and in a position to halt Iniesta in any way. He then combines with Neymar to wrap the game up for the Blaugrana. Once again Real’s central midfield duo failed to co-ordinate their movements to protect them against Barcelona’s attacking transition. Both of them leave the zone in front of the back 4 exposed and Neymar almost capitalises. It seems rather strange that a ‘defensive’ coach such as Rafael Benitez would neglect such an important aspect as balance in midfield. Although it has been a difficult void to fill since the departure of Alonso, someone such as Casemiro would have been capable of performing the anchor role, certainly much better than Modric or Kroos. Take nothing away from both of them who are fantastic footballers but are not reliable in defensive situations as proven in this game. It may be acceptable to field them both in a double pivot against the lesser teams in the league; however in a game such as this one would think that balance would be one of the key aspects to consider. Barcelona’s pressing scheme was another facet of their game to be applauded, as it is in virtually every game they play. Their main target for pressure in terms of personnel would often be Modric and Kroos as they were aware of their ability to dictate play from deep. Despite their focus on certain players in the opposition build-up phase they were still able to retain a solid compact structure. One of the great aspects of this structure is their ability to maintain access to every Real Madrid player, making it difficult for them to turn and face play should they receive the ball. That said it does seem fairly risky leaving players like Ronaldo 1v1 against a defender, however Munir has Ronaldo in his cover shadow thus blocking his passing lane. A trap has also been set for Bale who has deviated from his RW position in an attempt to circulate the ball. Should he receive the ball, he will face pressure from Alves, Busquets and Neymar. 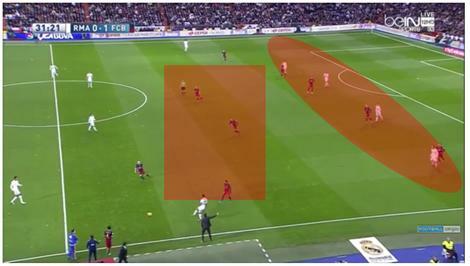 Barca were frequently able to create turnovers in possession through pressing in this way. 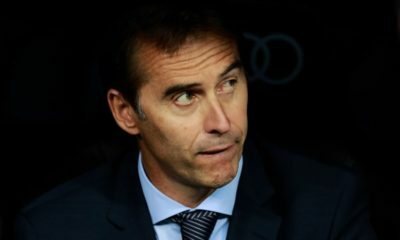 Real were unable to effectively prepare structurally and were therefore disorganised when possession was lost, giving Barca huge amounts of space to exploit in transition. Well for Real Madrid there is already a substantial amount of ground to make up. Six points behind leaders Barcelona at this early stage, their performances must improve and fast if they are to retain any hope of snatching the title from their eternal rivals. A second consecutive defeat in the league for manager Rafael Benitez has left him with a lot of questions to answer and his job hanging by a thread. What was most worrying was the disappearance of key players such as Bale and Ronaldo when they were needed the most; it is imperative that their stars step up to the plate in the big games if they are to see glory domestically and on the continent this year. The exact opposite can be said about Barcelona who sent out a massive statement to their title rivals with such an emphatic victory. It was made all the more remarkable by the absence of Lionel Messi, which begs the question: what would have been Real Madrid’s fate had Messi been fit and in the team from the start? Los Cules look more and more like title winners with every passing game and with the return of their star things could get even better.